An exquisite art piece for home or office, this beautiful five-inch Hand-Blown Glass Bowl is truly a treasure! Created by the Glass Eye Studio in Seattle, with their innovative glass blowing techniques, they have perfected stunning collectable pieces. A stunning stand-alone art piece displaying vibrant colors, this five-inch hand blown glass bowl is also functional as an elegant candy dish for any home, office or office lobby. 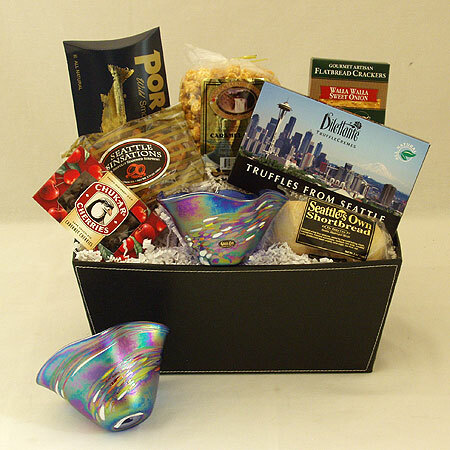 This Washington gift is partnered with Portlock's Smoked Salmon Fillet, Partner's Crackers, Seattle Sinsations Pretzels, Dilettante Truffles from Seattle, Snoqualmie Candy Co. Caramel Corn, Chukar Chocolate Covered Cherries, and Seattle’s Own Shortbread. An elegant and impressive Northwest art gift! With Iridescent Blue Glass Eye Bowl.